This week's recipe is courtesy of Ina Garten (a.k.a. "The Barefoot Contessa") from Food Network. My daughter and I watched this episode and practically shorted out the TV remote with drool. These look delicious! And they also received a solid 5 stars from Food Network viewers who have tried the recipe. Tip 2: If you watch cooking shows keep a listening ear tuned to the host suggesting freezing. Ina mentioned freezing this dough ahead and baking it as needed. - In the bowl of an electric mixer fitted with a paddle attachment, mix 4 cups of flour, 1/4 cup sugar, the baking powder, salt and orange zest. - Add the cold butter and mix at the lowest speed until the butter is the size of peas. - Combine the eggs and heavy cream and, with the mixer on low speed, slowly pour into the flour and butter mixture. Mix until just blended. The dough will look lumpy! - Combine the dried cranberries and 1/4 cup of flour, add to the dough, and mix on low speed until blended. - Dump the dough onto a well-floured surface and knead it into a ball. Flour your hands and a rolling pin and roll the dough 3/4-inch thick. You should see small bits of butter in the dough. Keep moving the dough on the floured board so it doesn't stick. - Flour a 3-inch round plain or fluted cutter and cut circles of dough. You can also choose to cut them into more traditional triangle shapes with a sharp knife. - Place the scones on a baking pan lined with parchment paper. Collect the scraps neatly, roll them out, and cut more circles. - Brush the tops of the scones with egg wash, sprinkle with sugar. - Flash freeze raw scones on a cookie sheet and transfer to gallon size ziplock bag when completely frozen. - Bake at 400* for 25 to 30 minutes, until the tops are browned and the insides are fully baked. The scones will be firm to the touch. Allow the scones to cool for 15 minutes. 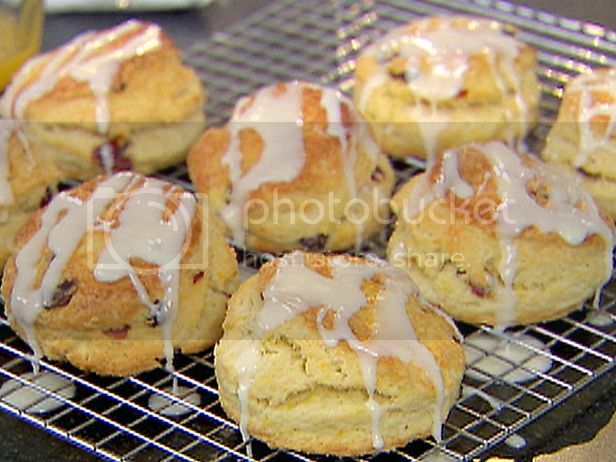 - Whisk together 1/2 cup confectioners' sugar and 4 teaspoons freshly squeezed orange juice and drizzle over the scones. Digging on the all the great info here! Just a question about the scones - are they thawed before baking? I'm thinking they must not be since the cooking time is about twice what a fresh scone would be.